Our region’s creeks and rivers represent ecological lifelines for humans and wildlife, connecting our mountains, forests, and coastline. A critical part of EDC’s work protecting wildlife and human health is safeguarding and restoring our watersheds, which are the essential link between our terrestrial and marine ecosystems. Healthy watersheds are critical to provide habitat for fish and wildlife, and clean water for our local communities. Working closely with landowners and local and state agencies, EDC serves as a community resource and watchdog, helping ensure that our creeks flow free and clean. Whether we are responding to clearing of habitat critical for wildlife such as the tidewater goby or the red-legged frog, or to unauthorized water diversions causing the stream to go dry, or partnering on extraordinary projects such as the Mission Creek Steelhead Recovery project, EDC stands strong as the voice for these ecological resources. 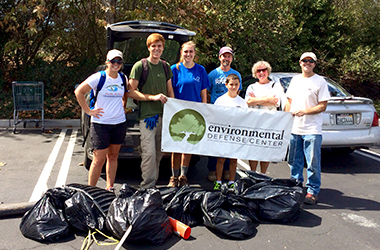 In 2017, EDC conducted six creek clean-ups throughout the Goleta Valley, removing trash that threatens local wildlife and pollutes our clean streams and ocean waters. Nearly 270 volunteer hours were contributed and more than 5,000 pounds of trash were removed from a number of creeks in the Goleta Watershed. EDC also represents and partners with other organizations to ensure that agencies protect and improve water quality and wildlife habitat in our region’s watersheds.